Charity for the poor is not always a virtue, more so if food security is at stake -- the best way is to help people help themselves. But this wasn't the objective of the late N T Rama Rao, former chief minister of Andhra Pradesh. He fulfilled his election promise of providing cheap rice to everyone through the government public distribution system ( pds ) at Rs two per kg. "Rice isn't the staple food in this area," says Salome Yes Das, training associate of the Krishi Vigyan Kendra at Zaherabad in Medak district of the state. "It was introduced through the pds . With rice available at as cheap a price as Rs two per kg, farmers lost interest in their agriculture and lands become fallow. Some of them started selling their lands to rich farmers. It clearly showed its impact on the economic, social, cultural and ecological fronts." Most people in the area are aware of the fact that rice is not as nutritious as traditional coarse grains (see box: Nutrition attrition ). But rice has become a status symbol after its promotion by the government, especially among children. Ask Ghadappama, an old lady from Kalbemal village of Medak district: "We eat jowar (sorghum) roti. But the children ask for rice now. This is the era of rice." 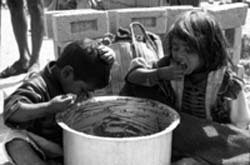 Another resident, Mohammed Mainodin, says, "If rich people can eat rice then why not our children. pds does not provide us sufficient rice. We do not have enough money to buy even the cheap rice. So we give them kanki (broken rice grains), which is cheaper." Siromani, a farmer from the same village, says, "I have some water in my fields and have started growing paddy for our use. Our children go to school and they say that children from rich families bring rice. They, too, want to eat rice." Nagamma an old lady from Mamidgi village of Medak, says, "Earlier we used to eat bajra (pearl millet), sama (barnyard millet) and kangani (foxtail millet). We began eating rice only when N T Rama Rao started providing it cheaply. Now children prefer rice. But jowar is good no doubt. We can't do without jowar roti. It helps prevent diseases." Sadly, her wisdom is lost on seven-year-old Priti, who prefers rice because it looks better than jowar . In Pastapur village, about 100 km west of the state capital Hyderabad, Tuljmma, mother of two, says, " Jowar roti is very good for work and stamina, but we have taken to rice for the taste. We started eating rice only after the pds shop began selling it. But even today, we give roti of yellow jowar to people who have become weak due to some disease". The craze for rice has taken its share in the fields as well. Narshmma of Kalbemal says, "We now grow paddy in irrigated lands for our use." P A V Udya Bhaskar, special commissioner with the state's department of rural development, says, "We have started watershed development programmes for integrated rural development by improving rainfed agriculture. Whenever farmers see water, they first go for paddy, then for commercial crops like groundnut, chilli, cotton, castor. The traditional crops don't provide sufficient economic returns. The shift from jowar to rice is quite visible in some areas." Paddy is a water intensive crops -- 15 million litres of water is required to produce one tonne of rice, according to S V Subbaiah and K G Pillai of the Directorate of Rice Research, Hyderabad. About half of the total irrigation water in Asia is used for rice production, according to L C Guerra, professor at the College of Engineering and Agro-Industrial Technology, University of the Philippines, Los Bans. While more than 90 per cent of the world's rice is produced and consumed in Asia. But water is becoming scarce by the day. Per capita availability of water resources declined by 40-60 per cent in many Asian countries between 1955 and 1990. In 2025, per capita availability of water resources in these countries is expected to decline by 15-54 per cent as compared with 1990. More than 80 per cent of the developed freshwater resources in Asia are used for irrigation. Agriculture's share of water will decline at a faster rate than previously due to increasing competition for available water from urban and industrial sectors. Almost all the coarse cereals are better suited for the dryland agriculture and demand little water. 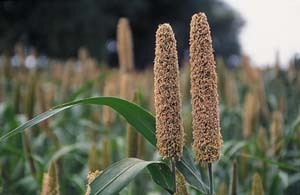 Sorghum is suited to low and moderate rainfall. Its performs well in drought. Under favourable conditions, it grows fast, which is why it is called the camel among crops. As per Union government estimates, the coarse cereal production of 31.46 million tonnes during 1998-99 has come from 11 per cent of the area under irrigation, while the rice output of 85 million tonnes accounts for about 50 per cent of the total irrigated area. Anwar Alam, deputy director general (engineering) with the Indian Council of Agricultural Research, New Delhi, says, "Paddy and wheat, the major cereal crops in the country, consume about one-third of the total energy consumed for production of major crops in India. Irrigation, whenever applied, demands the maximum share of the energy consumed in various agricultural operations (operational energy)." Andhra Pradesh's technology-savvy chief minister, N Chandrababu Naidu, has promised assured irrigation and power supply for agriculture. Taken in by promises, several farmers have sunk all available resources only to reap a harvest of misery, as media reports have indicated. A story in the Deccan Chronicle quoted A Lingaiah, head of the village council Mylaram in Kangal mandal of Nalgonda, explains that the paddy crop had withered away in 70 per cent of 40 hectares of in which paddy was grown. Chief minister Naidu told a recent press conference that "his government has accorded priority to irrigation with an unprecedented budgetary allocation of Rs 4,000 crore." Political promises aside, the state's farmers are unlikely to get assured irrigation. The state government, in the cabinet meeting on October 15, 2000, requested farmers to not go for paddy during the rabi (winter) season due to low level of water in Srisailam and Nagarjunasagar reservoirs. The government is also interested in launching a campaign to deter farmers from going for paddy in the rabi season. However, several ministers are understood to have told the chief minister that a majority of farmers were in favour of paddy in rabi , point out reports in the media. "No amount of persuasion by the agriculture and electricity departments is yielding results," a minister from Telengana region told The New Indian Express . Will it suffice to deter farmers from growing paddy in areas where irrigation is inadequate? No, says A Seetharam, Bangalore-based project coordinator of the All India Coordinated Research Project on Millets: "The only way out is to put the traditional crops like millets and jowar at par with paddy and provide proper remuneration to the farmers. This can provide regional food security. There is a lot of scope for these crops if we go for some value-added products." It isn't just Andhra Pradesh and Punjab that are facing such problems. Take example of Ajmer district of Rajasthan. The government has reduced the target for sowing of rabi crops. The worst affected is wheat, which is more dependent on irrigation than others. In 1999-2000, the targeted area under wheat was 75,000 hectares (ha), and sowing took place in about 40,000 ha. The drought in 2000-2001 has forced the agriculture department to lower the area under wheat to 25,000 ha. The area under other dryland crops like jeera (cumin) and oats is unaffected despite three years of drought -- sufficient proof to say that coarse grains are much better for sound dryland management. But the coarse grains cannot fulfil all that they promise unless the market for these crops is understood properly. G lobal trade in coarse grains in 1995 was to the magnitude of about 132 metric tonnes (mt) and is projected to rise to 175 mt by 2005. About 80-85 per cent of this export originates from industrialised countries, where coarse grains are cultivated for animal feed. In Japan, an ngo is working on promoting millets as heath food (see box: Revival of millets in Japan ). Amazingly, Asian countries are likely to be the major importers by 2005, points out 'Vision 2020', a perspective plan prepared by the National Research Centre for Sorghum in Hyderabad. If present trends continue, India's growth rate will be negative among the top 10 producers of coarse grains (see table: India: against the grain ). In their estimation of foodgrain requirement for the next ten years, India's policymakers don't see an important role for coarse cereals. In the ninth and tenth Five Year Plans, rice has been accorded 42 per cent of the total cropped area and wheat nearly 35 per cent, while coarse grains get only 14 per cent. The government has hardly even looked beyond its system of remunerative minimum support price and the public distribution system. In 1976-77, rice and coarse cereals had same price, a situation that continued till 1981-82. Thereafter, rice has a higher minimum support price. The announcement of minimum support price for coarse cereals is more of a ritual than a market intervention to ensure remunerative price for farmers. This is evident from the foodgrain stocks held by Union and state governments. Earlier, a small stock of coarse grains was held. That has disappeared 1995 onwards. India's pds , possibly the largest programme in the world to provide subsidised food, concentrates only on rice and wheat. The Food Corporation of India ( fci ) procures foodgrain for the 'central pool' at prices fixed by the Union government. The foodrain procured are released by fci through pds at the issue price, again fixed by the Union government. The 'central issue price is less than fci 's economic cost and the difference between the two is reimbursed to fci by the Union government as consumer subsidy. This has created a food surplus of rice and wheat -- on February 1, 2001, there was 22.4 million tonnes of rice in the government stocks and 15.4 million tonnes the same time last year, according to reports of the Comproller and Auditor General of India. On November 1, 2000, the rice stock was 200 per cent above the government's minimum buffer stock requirement of 6.5 million tonnes. But the high export price of rice at Rs 6,750 per tonne is much higher than what the Thai and the Vietnamese governments offer. So, there are no takers for Indian rice in the international market (apart from basmati rice, that is). Even so, there are people who wait for adequate food -- an irony that is lost on nobody. 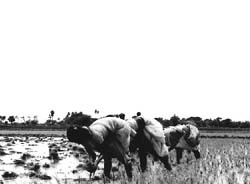 While pds ensures a regular market and a steady price for rice and wheat farmers, already supported by subsidies on irrigation and fertilisers and adequate crop insurance, coarse grains have no assured irrigation, no fertiliser subsidy (they mostly rely on farmyard manure), and insurance firms do not provide cover for these crops, abandoning them to hostile market forces. Cheap rice and wheat from the pds leads people who have traditionally relied on coarse grains to begin eating rice and wheat. A bounty crop of coarse grains leaves the farmer fearful of a drop in market prices. The farmers in rainfed drylands are forced to abandon their farms. They have no choice but to flock in city slums in search of employment. The Green Revolution, no matter how useful at the time it was launched, has failed to address these concerns. Among those calling upon Indian farmers to diversify is Norman Borlaug, eminent agricultural scientist who is dubbed the father of the Green Revolution. On a visit to Delhi in March 2001, he was asked how Indian wheat could be made more competitive in the international market. "Finding market for Indian wheat would be difficult as most industrialised countries which produce the cereal, such as the us , Canada and France, give huge subsidies. For the Indian government to give domestic subsidies to match international sops would be burdensome and unviable. The best way would be for Indian farmers to diversify," said the 87-year-old veteran, asking Indian farmers to diversify part of the rice/wheat acreage to more oilseeds, pulses and maize. C Gopalan, president of Nutrition Foundation of India, New Delhi, says the Green Revolution increased the production of only staple cereals like rice and wheat, but this is hardly enough for a nation faced with the challenges of competitive world. Even the White Revolution, which made India the biggest producer of milk, failed to tackle malnutrition because it cannot ensure that the right micronutrients reach the mother and child at the right time. "What India needs is a Rainbow Revolution," says Kamla Krishnaswamy of the National Institute of Nutrition, referring to the drop in production of coarse grains and pulses. There is no doubt that coarse grains make good environmental and social sense. Their low productivity is more than compensated by their adaptability, early maturation and assured harvests. Given the fact that the exchequer incurs large expenses on subsidising food supply each year, coarse grains provide cheaper alternatives for regional food security and nutrition of the poorest of poor. It is absolutely essential to provide policy support to these crops. These cereals would prove invaluable to address the increasing demand for not only food, feed and fodder without a severe cost on the ecology. Industrial products based on these crops can provide the right impetus to make these crops more competitive. It is time rice and wheat compete with coarse grains in a level-playing field. The winners of this competition will be India's poor and vulnerable millions, who have been forced to forsake their pride in their traditional grains. The byproducts will be adequate food for the stomach, adequate nutrition for the body, better management of natural resources and real food security. T he merit of kat-ki-kunni (timber-cornered building) of Himachal Pradesh can be traced back to 1905, if not earlier. A massive temblor levelled every village from Dharamsala to Kangra. Measuring 8.0 on the Richter scale, it lasted two minutes and was felt over 416,000 sq km. 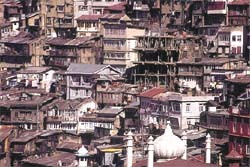 But, buildings with kat-ki-kunni design in the Kullu valley survived, mentions the India Disasters Report 2000 , brought out by Oxfam. The design is based on a simple fact -- corners are the most vulnerable parts of buildings when earth quakes. The design uses materials like timber and stone. The important feature is a pivoted wooden joint at special corners. This allows movement and takes care of tensile stress. Timber is one of the best materials for earthquake-prone areas, especially in the hilly areas of Himachal, Kulu and Kangra valley. Timber allows the flexible movement of forces. But timber is in short supply, and substitutes are not easy to come by. Steel bars are not easily accessible in hilly areas. Scientists such as A S Arya, head of the quake engineering cell of the Bureau of Indian Standards (BIS), have improvised and transformed traditional designs like the kat-ki-kunni into contemporary typology of continuous reinforced tie-bands. That they are called coarse grains summarises their present status in Indian society. Go anywhere in the country, and you will see a marked inferiority accorded to 'coarse' grains including millets, barley and sorghum. Someone who eats these grains, as against the 'fine' cereals rice and wheat, is considered poor. The production figures speak volumes. As the country goes about claiming record food production of 202.54 million tonnes during 1998-99, this increase is visible only in a few crops, mainly rice and wheat. The overproduction of rice has already led to problems. This became evident towards the end of 2000, when the Food Corporation of India refused to procure rice from farmers in Punjab. The media widely covered the plight of the Punjab farmers, but missed out on the root of the problem. The quality of rice was not up to the mark, which, scientists say, is a result of growing rice in areas where rice isn't the traditional crop (see box: Punjab's honeymoon with paddy ). India's food security as well as the nutritional security of its population precariously depends on rice and wheat. Self-sufficiency in food fails to cover the concerns of large populations in concentrated pockets -- people living in harsh and difficult terrain, in arid, semiarid and hilly areas without enough water to cultivate rice and wheat. Particularly vulnerable are tribal people. Coarse grains have played a crucial role in providing sustenance in these areas. The shift to rice/wheat-based food has abandoned them to chronic food and nutrition insecurity. In rural India -- especially the vast stretches of dryland belts stretching across the Deccan plateau, northern Karnataka, Marathwada, the deserts of Rajasthan and the tribal areas in central India -- coarse cereals have been the mainstay of agriculture, diet and cultural systems (see box: Second coarse ). Farming of these crops extends to 65 per cent of the rainfed agricultural land, where the concentration of the rural poor is heavy. Most drylands are characterised by physical, socio-economic and technical constraints. Coarse grains are well adapted to these harsh conditions. But lack of marketing avenues of these crops has led to their rapid decline. Government policy and its public distribution system ( pds ) blindly push water-intensive crops, especially rice, in regions where natural resources like water are already under severe pressure. Dryland agriculture has seldom faced such a crisis. The people of these regions are facing a double whammy. Their health is being undermined and their long association with livestock is in a sorry state -- residues of traditional crops provided sufficient fodder for the animals. The short-stalk, high-yielding varieties fail to provide adequate nourishment for livestock. Estimates point out that to meet the needs of the increasing population, production levels in rainfed areas have to double, says P V Satheesh, director of the Deccan Development Society, a non-governmental organisation ( ngo ) based in Hyderabad. "This will create problems when the suggested measures start becoming worse than the disease itself, for example, the proposed interventions relating to technology, inputs and infrastructural support, which in plain English translates to supply of more chemical fertilisers, pesticides and mechanisation of agriculture. In short, a new Green Revolution in the rainfed areas. Obviously, very few lessons have been learnt from the past," says Satheesh. His ngo has developed an informal public distribution system based on coarse grains (see box: PDS: a new avatar ). India has the fifth largest area under coarse grains after the us , China, Brazil and the Russian federation, according to 'Coarse cereals: changing scenario and research and development strategies', a paper prepared by a group of reputed scientists led by B S Dhillon, former assistant director general (foodgrain and fodder crops), Indian Council of Agricultural Research. In the 1996-1998 biennium, coarse grains were grown in 31.6 million hectares (mha) in the country, and production was 32.7 million tonnes. This was 17 per cent of the total foodgrain production. Moreover, the trend in growth rate is against coarse grains. Satheesh points out that for every further increase of 100 tonnes in India's foodgrain production, rice and wheat make up for 91 tonnes, coarse cereals for 5.5 tonnes, and pulses chip in with 3.5 tonnes. The cropped area, total production and per hectare yield of coarse grains increased gradually during the 1950s and 1960s, peaked in 1966-71, and declined thereafter (see graph: Coarse cereals: losing ground ) . "The income and consumption pattern of the poor is changing," says J G Ryan, former director of the International Crops Research Institute for Semi-Arid Tropics ( icrisat ) in Patancheru, Andhra Pradesh. "For instance, in India, shares of sorghum and millets in the budgets of the poor had fallen by 68 per cent in rural areas and by 51 per cent in urban areas between the early 1970s and early 1990s. The shift was away from coarse grains to wheat, paddy and oilseeds." A drop of 50 per cent in the cultivated area of sorghum, little millet and finger millet has come about just in the past decade. It was in the 1980s that the pds became a 'welfare instrument' to provide essential items at nearly half the market price, point out Laveesh Bhandari and Amaraesh Dubey of the Rajiv Gandhi Institute for Contemporary Studies, New Delhi. Slow productivity growth and low prices have reduced the competitiveness of coarse cereals in the market, resulting in crop substitution. Successive governments have allowed the area under coarse grains to shrink through the agricultural financing policies. Neither crop loans nor crop insurance are available for these crops. These can't benefit from government subsidies on inputs. Second, the promised minimum support price of coarse grains was more often than not denied to farmers due to government non-intervention. Third, government doesn't come to the rescue of the coarse grain farmer when the crop is badly damaged by unfavourable weather or when there is a glut in production, while crops like rice, wheat, cotton and tobacco are provided this protection. At 2.53 am on October 25, 1991, a moderate earthquake measuring 6.6 on the Richter scale affected more than 425,000 people of about 2,100 villages in the districts of Uttarkashi, Tehri and Chamoli in what was then Uttar Pradesh and is now the hill state of Uttaranchal. Traditionally built timber houses proved to be the most effective at keeping damage at bay. It would, however, be incorrect to say that the old-fashioned houses survived just because of materials used. The construction techniques, too, determined the amount of damage. Making houses for earthquake-prone areas is more about 'software' than 'hardware'. So, even if timber is not easy to come by, there are solutions. A S Arya, head of the quake engineering cell of the Bureau of Indian Standards ( bis ), says an additional expenditure of 6-10 per cent during construction can make a building quake resistant. Heavy roofs (slate tiles or RCC ) supported by weak walls (random rubble in mud mortar) proved to be deadly. Most new constructions were of this kind, which became popular in Uttarkashi region after the construction of the Maneri dam about 30 years ago. Older houses at higher elevations have timber roofs held together by timber 'tie-bands' -- horizontal timber beams spanning across the entire building, connecting the entire structure and giving it the character of a cage. Such houses suffered little damage despite the mud-and-stone masonry. The Dehradun-based People's Science Institute has worked on popularising features that make houses stand up better to earthquakes. Such houses must have tie-bands just above the level of the floor, the level of the doors and windows, and another at the roof level, point out Ravi Chopra and Rajesh Kumar of the institute. Corners are the most vulnerable and ought to be strengthened. Elasticity of the structure can be enhanced with flexible steel rods or wood batons at corners. Doors and windows should be few, small and symmetrically placed away from the corners. The house should be as light as possible. Anil Joshi of the Himalayan Environmental Studies and Conservation Organisation (HESCO) was involved in the construction of quake-resistant houses in Tehri and Rudraprayag districts after the 1991 Uttarkashi quake. He says all houses designed or guided by the renowned architect Laurie Baker remained intact even as many others in the vicinity collapsed during the 1999 Chamoli quake. Baker emphasises using local construction material. The poor masonry work and ignorance of traditional wisdom resulted in the losses in rural areas, Baker maintains. A massive earthquake had razed Shillong to the ground in 1897. This led to the creation of the 'Assam-type' construction that comprises bamboo frames, ikra weed and mud plaster for walls, roofs of thatch or corrugated galvanised iron sheets. The 1950 earthquake in Assam was the real test of this technology.The quake measured 8.5 on the Richter, changed the course of the Brahmaputra river, submerged the old city of Dibrugarh, but the buildings were unscathed. The foundation in the Assam-type construction comprises wood posts driven into the ground to a depth of 65-90 cm. Columns run from the foundation to the top storey.The superstructure rests on these columns for secure bearing. The walls, composed of wood posts, are spaced at 1.5-2 metres apart. A 15-centimetre diameter wood post beam supports the roof. A framework of bamboo with ikra reed panels is anchored to the frame from the walls. Ikra is normally plastered with mud or, sometimes, a lime mixture. 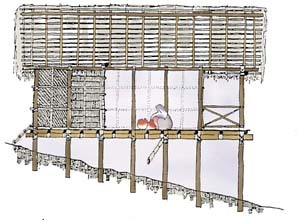 The voids are infilled with plastered ikra reed or split bamboo panels, which keep the structure light.